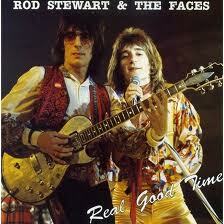 The Faces ~ Had Me A Real Good Time ! 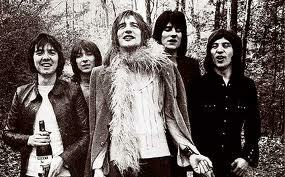 After the demise of the Small Faces in 1969 with Stevie Marriott leaving to form Humble Pie, the three surviving members Kenny Jones ( Drums ) Ian McLagan ( keyboards ) and Ronnie Lane ( Bass ) hooked up with Ron Wood and Rod Stewart fresh evacuees from the Jeff Beck Group, and named their new band The Faces. Jeff Beck is quoted as saying that “Wood and Stewart were like a couple of little schoolgirls always giggling and laughing together” and that he was pleased to get rid of them. 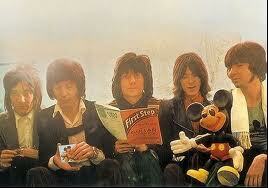 The initial Faces album ‘ First Step ‘ was released in 1970 and had the name the Small Faces on the front cover. 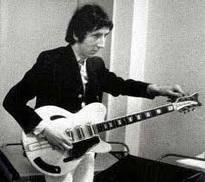 The album features lots of great charm but is slightly untogether with songs such as ‘ Three Button Hand Me Down ‘ and Dylan’s ‘ Wicked Messenger ‘ pointing the direction the band would take in the future, but it was really the folky Ronnie Lane song ‘ Stone’ that captured my ear! I saw the Faces play on the release of their second album ‘ Long Player ‘ at London’s Chalk Farm Roundhouse and what a show it was with Rod and the boys kicking soccer balls out into the audience and all of them drinking wine and brandy on stage. It was a real party atmosphere with the audience joining in for a sing~a~long at every opportunity. The second LP ‘ Long Player ‘ once again is a bit messy but with the Faces becoming a great rock n roll live act at this time. Two tracks on the album are live ‘ I Feel So Good ‘ and a brilliant cover of Paul McCartney’s ‘ Maybe I’m Amazed ‘ and the party theme of ‘ Had Me A Real Good Time ‘ is great, but once again it is the folk songs supplied by Ronnie Lane that also stand out! Album No. 3 ‘ A Nod’s As Good As A Wink To A Blind Horse ‘ with it’s great sleeve artwork would be the break~through album for the band . Outstanding songs on this album include ‘ Miss Judy’s Farm ‘ and the funny ‘ Your So Rude ‘ and ‘ Stay With Me ‘ .Every song is a winner and the band really gel and the songwriting had reached a high point. Finally the band made the UK chart with the 45 ‘ Stay With Me ‘ which exploded out of the radio helping to propel the album and 45 into the Top Ten. However this was followed closely by the solo success of Rod Stewart with the 45 ‘ Maggie May ‘ and the LP ‘ Every Picture Tells A Story ‘ with the rest of the Faces feeling like they where his backing band. That wasn’t what the Faces was about with their motto being ‘ All For One and One For All ‘ but the damage had been done within the group, most critically with Ronnie Lane who was very unhappy with the situation as some shows were billed as Rod Stewart & The Faces. By the time the final album ‘ Ooh La La’ hit the streets it was clearly all over but this LP had some high points with ‘ Cindy Incidentally’ making the pop charts and the title track becoming a fitting finale to a great group and with Ronnie Lane leaving the Faces to join the circus with his new ‘ The Passing Show ‘ band of musicians, big top, clowns and all! Ronnie Lane was the heart of the band and things were never the same after he left and today Ronnie is sadly no longer with us. 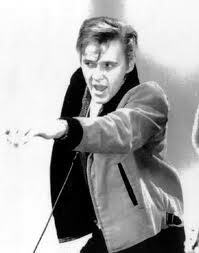 Kenny Jones joined the Who for a short while as replacement for Keith Moon. Ian McLagan would tour with Bob Dylan and the Stones and fronts his own Bump band,while Ronnie Wood joined the Stones as Mick Taylor’s replacement. Rod Stewart would do his Atlantic Crossing to the USA and his many blondes girlfriends, but never had another band to match the Faces. Blessed with a great voice maybe he sometimes reflects on the time when he had major solo and group success all in the space of one year with ‘ Maggie May and ‘ Stay With Me ‘ in the singles chart and ‘ Every Picture Tells A Story ‘ and ‘ A Nod’s As Good As A Wink ‘ in the album charts. So far Rod has resisted calls from Ronnie to sing with the band again ~ so the three remaining Faces ~ Ron, Kenny and Ian have played some live shows with Glen Matlock on bass and Mick Hucknell on vocals. Very good indeed ! 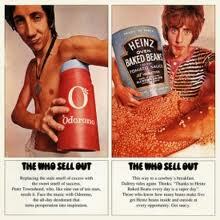 The Who Sell Out ~ Not Likely ! I have always been a big Who fan from the first time I heard them in my cousin’s bedroom in Dagenham, Essex at the age of 12. He had just bought a copy of the Who 45 ‘ My Generation ‘ which became one of the defining songs of the 60s. I love the power and the violence bursting out of that song and the stuttered voice only added to the tension. 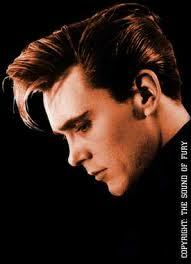 It shot up to the top of the charts in England and around the world and became an anthem for the young. Earlier that year 1965 the Who had released two other singles ‘ I Can’t Explain ‘ and ‘ Anyway Anyhow Anywhere ‘ both explosive songs with memorable Townsend guitar parts. The classic ‘ My Generation ‘ album was to follow with brilliant cover versions and Townsend originals like ‘ A Legal Matter ‘ and ‘ The Kids Are Alright ‘ This was the first of a long line of important rock albums from the band. The group in England always had a big mod following and were always a great live band with members Keith Moon on drums who was in a class of his own and totally irreplaceable just like Zeppelin’s John Bonham. On guitar Pete Townsend was to turn into a great songwriter but not the greatest lead guitarist in the world like Hendrix or Clapton but was completely locked into Keith Moon on each Who song and was exciting to watch. They would both smash~up their guitars, speakers and drums at the end of each live performance and would both leave the stage in chaos and destruction. John Entwistle on bass also known as ‘ The Ox ‘ was the glue which kept this group in time a very talented bass player who played his instrument like a lead guitar and was very loud with the treble control full on! On vocals ace ~ face Roger Daltrey was full of aggression and attitude having many famous fallouts with Townsend along the way but as a singer he just got better and better as the years when on especially live. 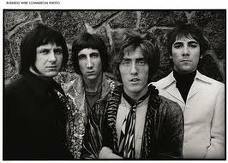 The Who would become one of the best live bands around in the late 60’s early 70’s and I love their performance on the Stones ‘ Rock & Roll Circus ‘ where their stole the show with their mini opera ‘ A Quick One While He’s Away ‘ and let’s not forget the stunning Woodstock performance. Back to the singles and next up in the British charts was ‘ Substitute ‘ which I think is a brilliant bit op pop with the lyrics. My favourite Who album is their third ‘ The Who Sell~Out ‘ from 1967 featuring the top ten hit ‘ I Can See For Miles ‘ and pirate radio jingles in between the tracks. After the huge success of ‘ Tommy ‘ probably the most overlooked album is the double ‘ Quadrophenia ‘ from ’73 with great songs like ‘5:15 ‘ ‘ The Real Me ‘ and ‘ Love Reign Over Me ‘ and don’t miss the movie if you haven’t seen it with a young Sting in a starring role, made in mod heaven Brighton. The group was never the same after the album ‘ Who Are You ‘ and the death of Keith Moon but Kenney Jones was brought in to fill the drum spot and the group made a spirited go of things in the 80’s and the hits kept on coming. In the later years Ringo’s son Zak has been a good substitute laying down a rock steady drum beat, you can see him on the excellent Royal Albert Hall DVD which is highly recommended. In 1990 The Who was inducted into the Rock n Roll Hall of Fame and following the sad loss of bassist John Entwistle in 2002 the band is down to two original members Roger Daltrey and Pete Townsend who have admirably soldiered on and I am just putting this suggestion out there that maybe one day we might see Townsend on guitar and Daltrey on vocals join forces with Paul McCartney on bass and vocals and Ringo Starr on drums to record an album from a band that would be worth waiting for!